No, not me. The bunnies are at shearing time again. They get shorn every three months, and I have them staggered a bit so I don't have to spend an entire weekend shearing bunnies and trying to get angora out of my mouth. I tried plucking the fiber once in Flora and Fauna. It took forever, the bunnies hated it, and it left bare patches on them. The poor bunnies got to where they cringed just seeing us come near them, so I finished by shearing the rest of their fiber and promising them I wouldn't do that again. Besides, in these colder months coming up, they still need to shed their fiber to avoid getting wool block (sort of like a fur ball in cats, but can be lethal in the bunnies), but they still need to stay warm. Shearing I can leave them a bit more fur to keep them warm, whereas with plucking, the entire length of fiber is gone. Up here in Maine, the bunnies need to stay warm! 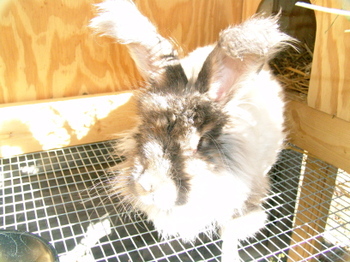 My bunnies are outdoor bunnies, and they each have a hutch as they are territorial animals. We have the three hutches arranged so each can see one or two other bunnies for company and still have their own territory. We use the hay and droppings that fall under the hutches as compost - great stuff! Merriweather (Opal Agouti bunny). This bunny was given a name of Blue Angel by her breeder, Chris Morgan so should I ever breed her, I will need to officially use that name, but for the purposes of daily life, she now becomes Merri, short for Merriweather. As a prize, I had put forth sufficient sock yarn for a pair of socks for each of the names. Since all three names came from the same person, Gayle has a lot of socks to knit! She will be receiving a hank of Celestial Merino in "Sugar Maple" colorway, a hank of Fleece Artist in an unlabeled colorway of blues into greens, and a hank of handpainted yarn from Aspen Moon Arts Handpaints in "Beaches" won in a Katrina eBay auction last fall. Thank you, Gayle! Erin of PumpkinMama suggested "Fluffernutter" for the Opal agouti rabbit. Rose of Enchanted Ewe suggested Daisy, Coco & Chloe. Gayle suggested the names of the three good fairies in Sleeping Beauty: Flora, Fauna and Merryweather. Robyne suggested Opal, Bertha & Beulah ("B" names for bunnies). Jewel played on words with Hairyette. Megan (of lambing fame) suggested Flopsy, Mopsy and Cottontail - age old favorites. 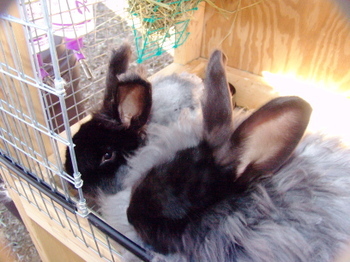 Chris of Woolybuns who is the breeder of all three of these rabbits, indicates that the sire of the two black does is named "Muffin Man" and the dam is "Lily." That suggests "Cookie Doe" for one, and "Dahlia" or other floral names for the other black doe. And finally, Allison of Quantum Tea suggested "Si" and "Am" for the two black does. Suggestions are still welcome. I am using my children for the voting committee to select the winning names! I have some very nice sock yarn from Fleece Artist for the suggestors of the winning names! Here are the first shots I have of my three new adoptees. These are all German hybrid angora bunnies. I've had bunnies before, but never angoras. These I adopted from Woolybuns aka Chris in Connecticut. I need some name suggestions befitting these lovely girls. 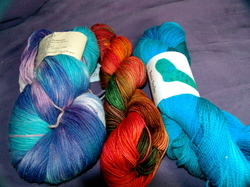 I will gift a skein of sock yarn (sufficient for a pair) for each of the three winning names. My children will be the judges. So, E-mail me your suggestions - humor, alliteration, puns welcome. Three of my kids and I drove down to CT on Sunday and picked them up. Originally, I thought I was going for the two black does, who are six months old and from the same litter. The Opal agouti had been promised to someone else, but they lost contact, so she offered her to me. She is about 18 months old, and very sweet! My eldest DS latched on to her immediately in the car. He uncrated her, and held her next to him or on himself for the entire ride. And she never had an accident. 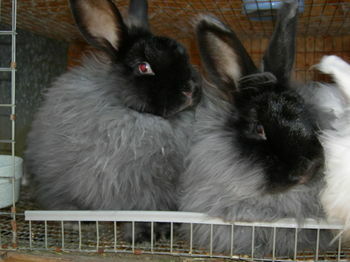 The two black does differ only in that one has furry tufts on the tips of the ears, and her sister has smooth ears. Chris took the time to demonstrate to me how to shear the bunnies with the furry eared black doe. The Opal agouti had been sheared about ten days ago. So, today I sheared the remaining black doe. Given that it is the first time either of these black ones have been sheared, I am VERY impressed with the temperaments of all three of these girls. The bunnies seem to essentially trance themselves while being sheared - they close their eyes and lay there passively in all sorts of positions - side, back, tummy - you name it! I now have a pile of bunny hair - the portions that aren't spinnable I am offering to Kathy at my LYS (courtesy) as she does needle felting. She can use what is helpful and offer the remainder to the birds and squirrels for nest building. Remember when I attended the Maine Spinners' Registry Spin Off in Newport, ME back in February? Well, my buddy Megan (with whom I work) was talking up bunnies and angora. It prompted me to buy some bunny crack blend and some pure bunny to play with. Next thing I know, I am perking up my ears when someone is talking to the woman from whom I bought my Ashford Joy about bunnies. It turns out she used to have 25 bunnies and spun/dyed her own bunny fur and blends. So, I listen to the care and feeding talk while at the monthly spinning meeting. She was recommending Completely Angora to the person with whom she was speaking. Wouldn't you know I found myself wandering through eBay seeking a copy after discovering through www.vivisimo.com that it was out of print? And, in the course of wandering through the internet seeking more information about the angoras, I stumbled back onto Chris's blog site through the backdoor (internet) as opposed to through my bloglines list where she also appears. Well, several E-mails back and forth, and I am getting these two beauties from her in a couple of weeks. They are German hybrids, good woolers, but not show quality. They are considered black in color. Their hutches will be next to my goose house, with the potential for putting them inside the goose house (the geese rarely use it) if the weather gets really cold. I already have portable fencing so they can hop around in the grass when it finally makes an appearance around here.